So many people have helped me do research for my novel that it would be evil of me not to thank them. At what point would I add an acknowledgments section to my ms? I get the feeling that an agent requesting a full wouldn't really care that Aunt Milly let me use her library card or that Grandpa Joe was an invaluable resource on the minutiae of dairy farming. You add the acknowledgements page when the novel has been bought by a publisher. Do NOT send acknowledgement pages, dedication pages, thank you pages or anything BUT your writing in a query letter or manuscript. 10. Including a 10 point questionnaire for me to fill out so you can decide if I'm worthy of having you as a client (let's all just agree now I'm not). A couple of comments popped up that said "what?? no name in the upper left?" The mistake of the rank amateur is to put that AND MORE in the upper left. I get mss that say "Miss Snark/Miss Snark's Guide to Etiquette/1745 Broadway, New York NY 10023/212 782 9000, misssnark@wtf.com until 2/1/06 then misssnark1@wtf.com"
Correct format: Snark/Snarks Guide to Etiquette upper left. Page numbers lower right. That's it. All other info on cover page. Got it? #2 - you mean not on every page right. All that is ok on the cover page, right? Wait, putting your name, etc., in the upper left corner is a mistake? I think the whole upper left corner thing is for screenplays. Chiming in here too, I've been putting a (limited) contact details blurb (i.e. the basics, not my starsign or anything) on the top left of the cover sheet only - please tell me this is not a huge faux pas, and if it is, why? Umm isn't your name and such supposed to be on the first page? Umm ummmm isn't it? I'm glad to see others are as stoopid as I am. If not on the first page, upper left, then where? Please tell us, Miss Snark, if we're all walking around dumber than dumb. Yeah this is news to me. On screenplays the name and address is the lower left corner. Most of my fulls are sent as Word attachments or pdf's. On the clarification: Phew! For a minute I thought I was a worse idiot than I thought myself to be! on my last comment: That wasn't very clear, was it? I'm going to bed, pulling the covers up, reading a book and pouting. "2 Pixie Warrior/de Vienne 2." This is wrong? And RRB, you are a tad cranky, aren't you? Of course writers are paranoid. It's in our genetic makeup. That which makes us write also makes us nuttier than fruit cakes. If in doubt read the agent's submission guidelines. See what they say. So keep it clean and uncluttered, right? That way it's easier to read, and the page doesn't look like it has a rash. The whole (c)2006 question... Some sources I've seen say, yes, got to have that somewhere. Other say no, foolish one, leave it off altogether. I'm wondering if I'm getting confused between countries, or just ancient vs modern practices. Can anyone help? I've been putting name and title on the bottom left. Maybe it's the UK/Aussie way, or maybe I'm a nitwit. See above. Regarding (c)2006...I don't know what the rule is in the UK/Australia, but in North America this is indeed the sign of a rank amateur (even more of a rank amateur than me, an unpublished writer and neophyte snarkling). Anything you write is automatically copyrighted as soon as you've written it. No need to mail it to yourself or to register the copyright officially: legally it's already yours. Agents, editors, and even other serious writers wouldn't dream of stealing it. Suggesting that you think they might (by indicating to the agent or editor that you've done any of the above) means that you don't trust them to be professionals, and that you don't know how the copyrighting process works. Again, I don't know if this holds true for the UK/Australia. Also, I believe Miss Snark used the example (c)1996, which is also bad for another reason entirely: it gives away the fact that the MS is old and you presumably haven't edited it or written anything else (or at least anything you think is better) since then. you don't need the copyright statement. Anyone who says you do is probably not talking about a manuscript for an agent or book editor. You do not need the copyright symbol in the UK or Australia either. Promise. I believe you! Thanks all for your help. re: page numbers: a well-known copyeditor recently asked for them to be on the top right, which is what I have heard. Whew! For a second, Miss Snark had me concerned. I've never put my contact info in the header of ever page, just on the cover letter, but when I saw that, my heart stopped. Thanks for adding that amendum. (yes, I know I spelled that wrong) I've also put the page # on the top right corner. Oops. Thus far it hasn't been a deal breaker, (what deals???) but this bit-o-info will stick in my mind on any further submissions I make. sheesh, I'm more confused than ever. Almost every guide that I've read, including those of publishers and agents who requested my ms, as well as market tomes, said to put contact info and word count upper left. I'm positive. So that's what I've been doing. Damn, is nothing simple? All these freaking protocols. I like the guides that say, hey, 1 inch margins all round, TNR or Courier, double space, contact info on page 1, title/author/page # on all other pages. 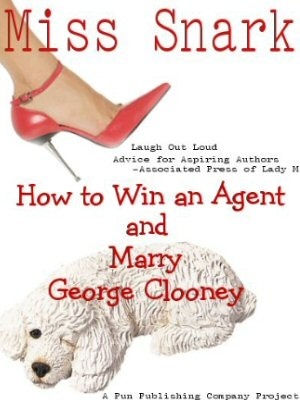 Am I supposed to believe that an agent is going to snark, sorry, snarl, and fling away a ms cause the contact info is on the right and not the left, or is on page 1 rather than the title page, or something like that? I plead guilty to the copyright statement gaffe. And that's because I read in agent's guidelines years ago that I should put it. Maybe it's the sign of an amateur, but so far it hasn't hurt me. *knocks on wood, fingers lucky charm, sends prayers heavenward*. I'll omit the copyright nonsense in future, but I'm not convinced of #2, Miss Snark. Not that I'm questioning your expertise for a second, but I've seen so much to the contrary. Maybe individual agents differ on this??? yes, my experience has been the same, but some say contact info upper left of page one, genre and word count upper right. so what gives? I think maybe most of the confusion is in the wording, but I could be mistaken. This is how I read it. I get mss that say "Miss Snark/Miss .....on --EVERY-- page. EVERY being the key word. I think this means the header. I think Miss Snark's--cover page-- is what I think of as page one. The books I have that show how to format a manuscript say page number in upper right hand corner. But if lower left is where agents would rather have it, that is where it will go.
" re: page numbers: a well-known copyeditor recently asked for them to be on the top right, which is what I have heard." Ditto this. Production departments prefer for page #s to be upper right. I don't know why Miss Snark has a *personal* preference for lower right, but if you do adhere to that rule, you should anticipate having to change it when turning in the ms to the publisher. Honestly, I think that obsessing over where the page #s are when in the submission stage is more the mark of an amateur than any chosen placement of the info could be. thanks anonymous #... uh... #... dang... the one who explained the confusion in the wording. And to the anon who mentions the futility of obsessing over page # placement at the submission stage--- great point. I'll remember that. I recently attended a writing workshop where group members reviewed each others' opening chapters. This was a group mixed with both published and non-published authors. EVERY SINGLE MS HAD A DIFFERENT WAY OF DOING THIS. ALL OF THEM WERE READABLE! I swear to God I read a horror story about an awesome manuscript whose cover page became detached. A publisher loved it, but had no idea who "Smith" was. So it's still verboten to put just *one* piece of contact info on every (non-cover) page? Anon #-I have no clue- about your horror story reding of detached cover page.... There's really no need to do it on any other page. Here's why. (And no, I am in NO WAY trying to be snarky) All your info will not only be on your cover page, but it will also be in your cover letter. If all the appropriate info is there, you'll be just fine. Just put "Smith's Tomb/Smith" in your header for the rest. I assure you, you'll be A-okay.